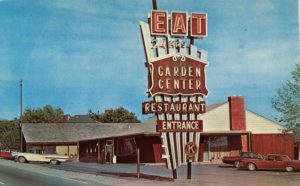 Demolition of the building best known as the Garden Center Restaurant, begins on Monday, June 12, 2017, and will be completed Tuesday, June 13 between 7AM-10AM. Built by the Hepler Family circa 1959 as its second feed store and first retail hardware store with a restaurant on-site, the building is being demolished, with plans to rebuild retail space on-site immediately. 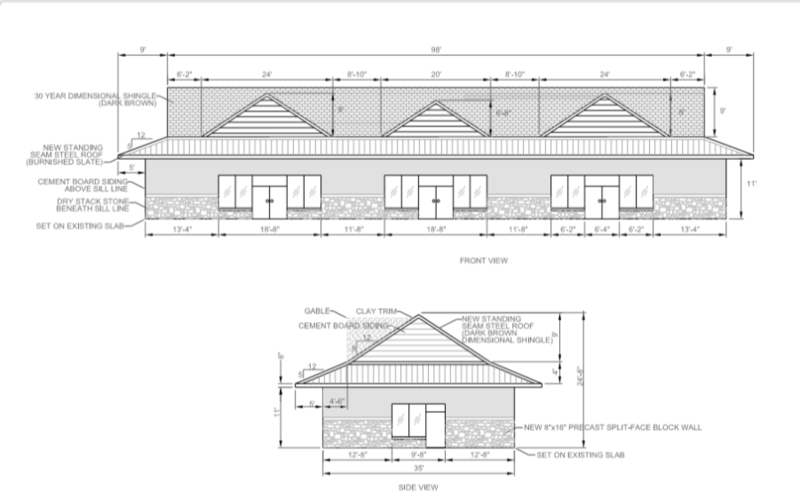 The new building, being erected by Sheraw Construction, is expected to open in September, with a grand re-opening of the New Stanton Antique Co-Op, complimented by plans for new a coffee shop as well. The site is also home to the new Hillside Orchards Farm Market stand, which will remain open 10AM-6PM throughout demolition and construction and year-round thereafter. The Hepler family came to Youngwood in 1942, when they purchased a small feed store at 106 North 4th Street from Oscar and Emerson Lankey, and purchased Stanton Milling from the Stanton family just a few years later. In the late 1950s, Albert Karl Hepler and his son Robert Henry “Bob” Hepler acquired property to construct a new building at the end of town. Sadly, A.K. Hepler died before the building was completed. 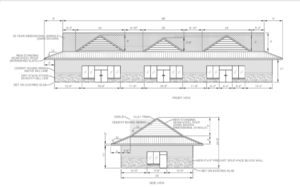 His son Bob Hepler moved forward with the building plans. Initially, the site housed the relocated feed store from Youngwood, plus incorporated the new retail hardware store temporarily, and a small restaurant. When the remainder of the building was completed on the lower level, Hepler’s Hardware store moved to the downstairs to its present-day location, and the restaurant expanded into the available space along Route 119 North. 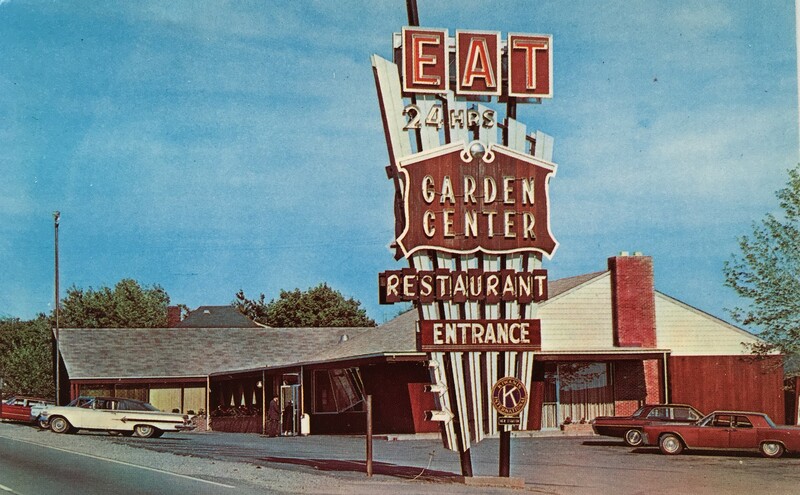 Garden Center Restaurant was one of the only restaurants in the region open 24 hours a day. It was a popular destination for post-prom breakfast-goers as recalled Jack Herbert – a Connellsville graduate and present owner of the on-site Antiques Co-Op business, who himself dined there after prom. Many travelers stopped here on their way back from the horse-races in Little Washington. And with a private dining room, it was a popular place for area Kiwanis meetings, local business association dinners, and family celebrations. Because it was open 24-hours a day, for a time the restaurant also served as a CB radio relay station for the local and state police departments. Oral history indicates that the cooks and staff were trained to receive calls, and forward them on to emergency officials by way of CB radio. Managed by fellow proprietor Oren E. Hopkins, Garden Center Restaurant was best known for its home-style cooking, but especially its coconut cream pies and pecan rolls, in addition to fresh donuts and cloverleaf rolls. Baker Mary Thomas, a local centenarian, is said to have prepared 80-100 pies each night with the help of staff. The new building, designed by Sheraw Construction, will take about 90 days to build. When complete, it will feature some red architectural elements, a visual reference to the old Garden Center Restaurant. The site will retain its town and country marketplace feel, especially as it features the new year-round farm market stand by Hillside Orchards LLC and other local vendors. Local citizens who may have pictures of the old hardware store or Garden Center Restaurant, or businesses interested in the new retail space and farm market, are encouraged to call Hepler’s Town & Country Enterprises, Inc. of New Stanton at (724) 925-2901, or email heplerenterprises (at) gmail.com.